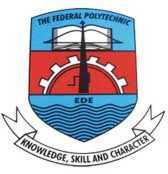 Federal Polytechnic Ede school fees schedule for 2017/2018 academic session for Pre-ND, ND, HND and Summer students. All students of Ede Poly enrolled in Pre-National Diploma, National Diploma and Higher National Diploma Programmes are to note their school fees for 2017/18 session. The management of the Federal Polytechnic Ede, Osun State has released the amount to be paid as school fees by both fresh and stale students [full-time, daily part-time, regular part-time HND, ND, Pre-ND and Summer] for the 2017/2018 academic session.